A350 XWB News: The ADHF "advanced dropped hinge flap" patented by Airbus onboard the A350 XWB. Simpler than a conventional flap, half tonne weight reduction and tested in the High lift ‘zero’ rig. 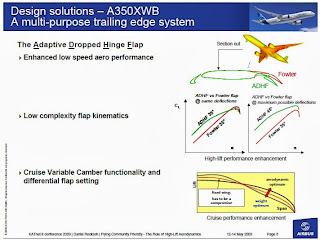 The ADHF "advanced dropped hinge flap" patented by Airbus onboard the A350 XWB. Simpler than a conventional flap, half tonne weight reduction and tested in the High lift ‘zero’ rig. The high lift system is one of the most mechanically complex systems on the aircraft. 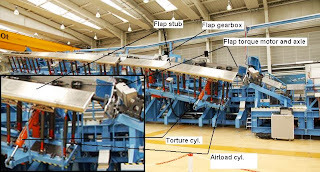 The system comprises a complex series of mechanical drive-shafts, actuators and linkages that deploy the slat and flap systems for take-off and landing. 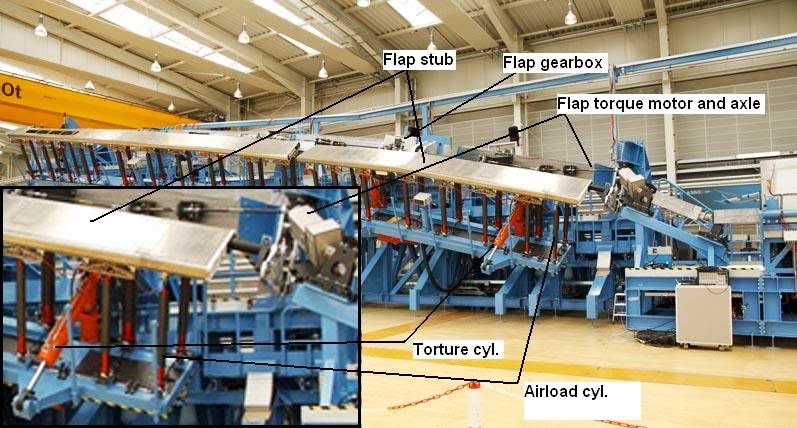 Due to the potential to generate roll asymmetry that could not be controlled if deflections were different between left and right hand wings, the systems also comprises a complex detection system to lock the slats and flaps in place if a failure is detected. 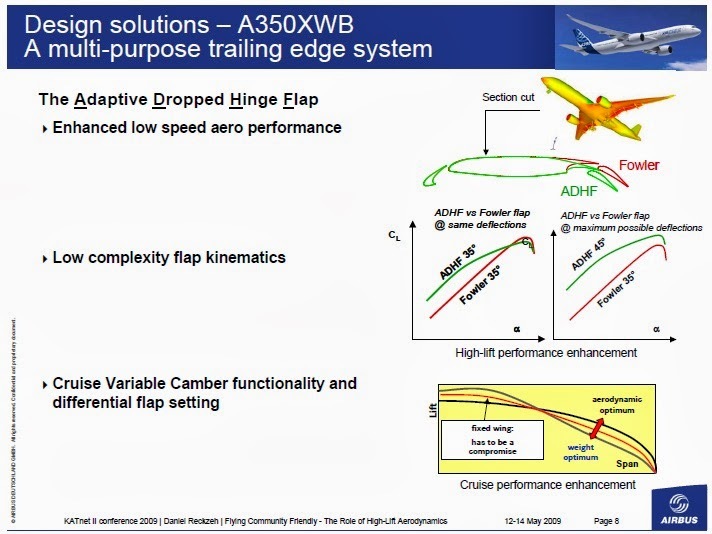 The A350 XWB high lift system also includes new technology with the Advanced Drop Hinge Flap (ADHF) system. 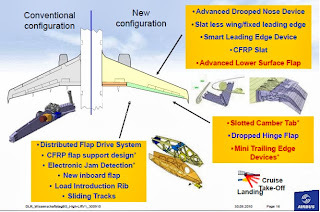 A new trailing-edge high-lift system has been adopted with an advanced dropped-hinge flap (similar to that of the A380), which permits the gap between the trailing edge and the flap to be closed with the spoiler. A stub flap is subject to simulated air loads generated by pneumatic cylinder being compressed by a hydraulically operated frame. The Airbus high lift ‘zero’ rig, located in Bremen (Germany), consists of a complete left hand ‘wing’ with all the systems that will be found installed on MSN001. The aircraft structure is not present and is replaced by a steel structure to allow the system to be installed and operated. The right hand wing is simulated by a high technology electro-hydraulic brake system. This test rig is used to perform many safety tests prior to the first flight to ensure safety. 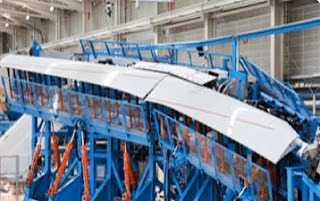 A number of tests are performed on this rig that would be too dangerous to perform in flight – deliberate failures of shafts or drive links, for example. 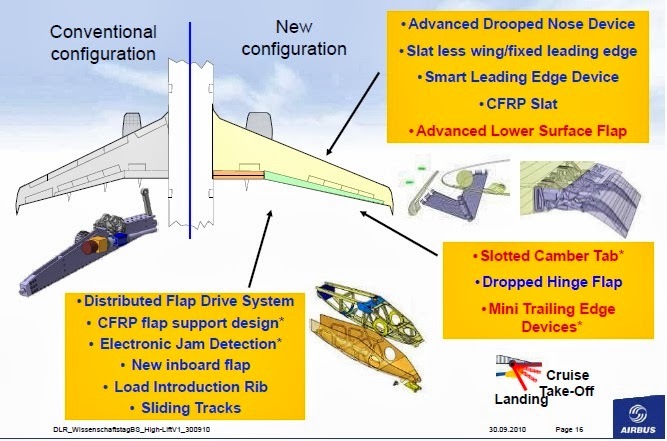 The new high-lift flap, which has been patented by Airbus, is a dropped hinge design and consists of a beam with a rotation point. 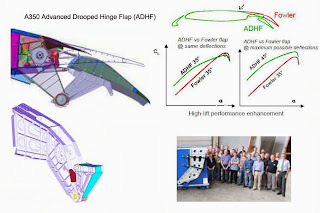 Designated as the "advanced dropped hinge flap," it is simpler than a conventional flap and requires less moving parts, resulting in a half tonne weight reduction. It is also easier and less costly to maintain. It is good that technology has improved the tools that can easily analyze what better can be done to improve the efficiency of the a particular equipment or part of a machine. This is an intresting blog that you have posted, you shares a lot of things about Hinge Suppliers, Continuous Hinges Stainless Hinges.